We sell petite pillows, travel pillow, memory pillow, orthopedic pillow, water pillows, back pillows, back braces, lumbar pillow rolls, memory pillows, TENS units, EMS units and more..
a. Fill Pillows (16 X 24 X 4.25") provides gentle head and neck support at a more economical price. The fiber filled Fill Pillow is designed for years of restful support. b. Petite Pillows (13 X 19 X 3.5") is made for small adults and children, this pillow features the same high quality construction and materials as the full size pillows. This pillow is also great for travel. 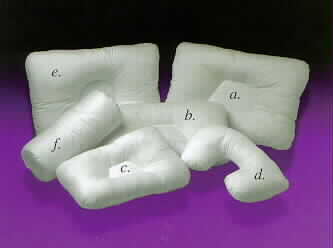 d. Travel Pillows (18 X 12 X 4") can be used in a hotel, automobile, or airplane. Also for use in the house, while watching TV, reading or napping. e. Fiber DH Pillows (16 X 24 X 4.25") is filled with Dacron Hollofil fiber, the industry's highest quality fiber fill, that is resilient, NON-ALLERGENIC, odorless and has lasting plumpness. Fits in a standard size pillowcase. New anti-microbial fiber! f. Support Roll (16.5 X 7") has many uses. Filled with ultra soft fiber fill, this pillow forms to fit your neck, back or legs. Great for lounging or napping. The Standard Support Roll pillow has a premium foam center that provides added support.